This makes GA Solar 4 the 2nd-larges solar project East of the Mississippi, second only to the massive 400 MW Piedmont project in Virginia. As seen in the above photo, everybody was there. 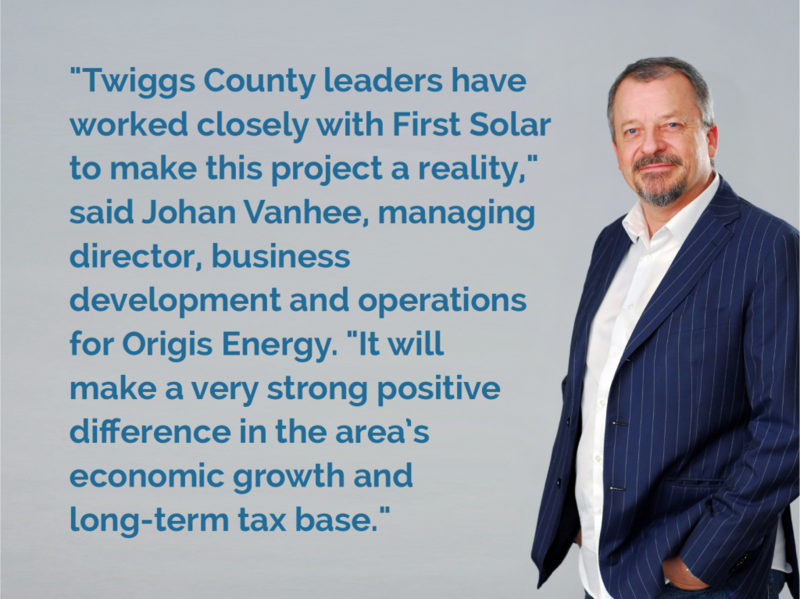 And by everybody, I’m including not only county, Origis and First Solar officials, but at least three sitting members of the Georgia Public Service Commission. This includes two Republican solar champions – Chair Lauren “Bubba” McDonald and Vice-Chair Tim Echols – as well as Patricia Pridemore (R), who was appointed by Governor Nathan Deal (R) and who has been a favorite of utility giant Southern Company. Georgia has been an interesting case study in which Republicans – led by Bubba McDonald and Tea Party leader Debbie Dooley – have been staunch advocates for solar, and starting as early as 2012 pushed Southern Company subsidiary Georgia Power to deploy significant amounts of large-scale solar in its service area.